Penthouse owners of Canderel’s new YC Condos suites in the heart of downtown Toronto will be connected to their home through their smartphone in a way most people could only imagine. 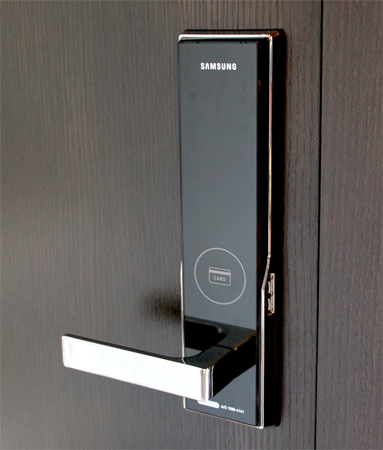 Working with Samsung Corp. and Truemarque Ltd., the sole distributor of Samsung Smart Home products in Canada, Canderel has made a wireless smart home package a standard in each of its penthouses and an optional add-on for other units in the building. That means that condo owners can use the smartphone to see who’s at their front door (or elsewhere in the apartment from the other connected video cameras) and choose to unlock the door from their device. When at home, the condo owner will be able to control their audio system, television and Blu-ray player from the same device. Motion sensor lights will turn on and off automatically as the resident moves around their home. Canderel, one of the largest developers in the GTA with more than 5,000 condo units either built or under construction is targeting young professionals between the age of 20 and 45 living in the downtown core. It sought a partnership with Samsung as a way to offer that demographic connectivity to their homes from the devices they already rely on for so many other things. For Samsung, the smart home market is a growth opportunity, says Paul Brannen, the senior vice-president of enterprise and mobile solutions at Samsung. It has already been building smart connectivity features into its electronics such as televisions and speaker systems and now it’s looking for a way to bring it all together. Rather than rely on wiring condos with CAT5 cable and using PCs to control the system, Samsung sees a combination of wireless technology and a smartphone or tablet control being the winning combination for smart homes. Using Bluetooth Low Energy, a Wi-fi hub, and Wi-Fi Direct technology, a mobile device or wall panel could feasibly control every other connected device in the home. For YC Condo residents that want to add on the package, the cost will be just under $10,000, according to Dhanji. Plus, you can start with a couple door sensors or a smart lock and work your way up from there, adding additional devices or sensors to the system over time. While a Samsung device is featured as the control unit at first, Truemarque will be developing other apps for platforms like iOS so more condo owners can take advantage. Samsung wants to be the leader in the market, Brannen says, but it also doesn’t want to create a closed eco-system, as it could be beneficial to connect with other manufacturers in areas that Samsung doesn’t cover.